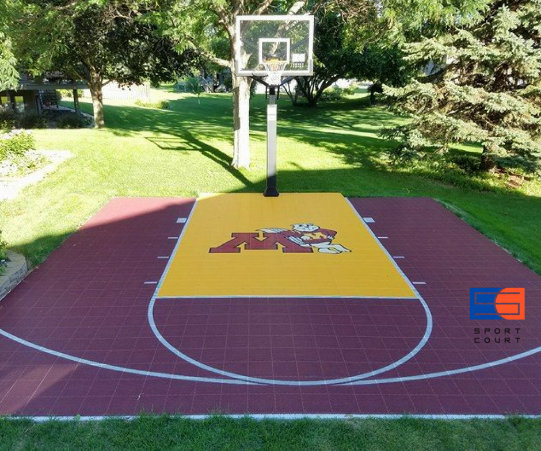 Anytime that Sport Court North receives a testimonial from a client, we want to share their experience with the general public. We received quite the testimonial from Michael Sokol in July. Michael is from Minneapolis and is a proud University of Minnesota graduate. 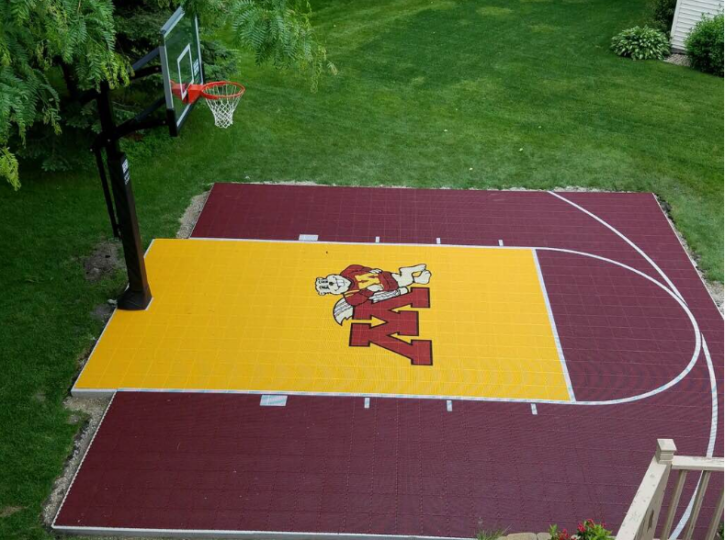 He showed that off with his choice of Sport Court. We want to thank Michael for his honesty and thoroughness in his review. “My journey started as I was looking for a safe and fun way to provide an entertainment space for our friends and family to get together. In the three years living in our new home, we had very seldom spent time in our backyard, as it was lacking any sort of entertainment feel. I began researching ways of bringing our backyard to life and came across Sport Court North and a few other competitors that provided similar services. I did a fair amount of independent research on the pros and cons of the sport surface major players in the Twin Cities area, as well as the opportunity to undertake a project myself. This was a considerable investment for my family, so a key buying decision was ending up with a product that was high-quality and sustainable. My research leaned heavily towards Sport Court North as the option that would provide the optimal experience and long-term durability I was looking for. After a few weeks, I engaged with Craig Jones to learn more about his service and solution. Upon meeting with Craig, I experienced a very thorough consultation, as I expected from the other reviews I read about Craig and his team. Craig was very patient as I asked many questions about the product and a design that would best fit my needs. He was then able to recommend a solution that accurately fit my needs and explain why alternative layouts or designs would be suboptimal for my backyard. At no point did he disparage competitive brands and he was able to thoroughly explain the benefits of why his product and team would be able to meet my needs and within my budget. He left me with confidence that my business was important to him and he could deliver a solution in my condensed time window. After a few more weeks I signed a purchase agreement and we began planning the details of the project. As we began scoping the finer details, Craig was very good about providing an accurate cost estimate and expectations for the installation and final product. It wasn’t until about three weeks before installation that we ran into our first challenge. My city had some rather stringent easement restrictions, which Craig had to work out with the city. This proved extremely challenging as the responsiveness from the city was not timely and they weren’t clearly communicating what my options were for a resolution. Craig was able to successfully remedy the situation with minimal involvement from me. I was admittedly somewhat high-maintenance through this process as I wanted to hit my deadline and he was very calm and persistent in following up with the city and communicating back to me where we were in the process. This was absolutely unbelievable customer service, which I must say is not often replicated in my experience with other service providers and major purchases. When the week of installation arrived, Craig was able to prepare me for the cadence of steps that would take place and the necessary contingencies should we experience inclement weather. Due to some rain, we did have to spread the project out over a few extra days, but we ultimately hit the deadline! I was amazed at how efficiently the crews worked and what care they took for my yard and clean-up. From excavation, to cement pouring, to court installation, the teams worked very quickly and carefully and left minimal indication afterwards that such a project had taken place. I am absolutely confident I made the right buying decision. The court is perfectly level, my yard was cared for, the surface has proved excellent for many games of basketball and it looks unbelievable! It has become quite the hit with the neighbors, family, and friends. In the two months since getting the court, we have spent more enjoyable hours in our backyard than we did the previous three years owning the home. I can’t say enough great things about my experience working with Craig; he is respectful, personable, accurately represented his product and approached the project as if it was his own yard and investment.